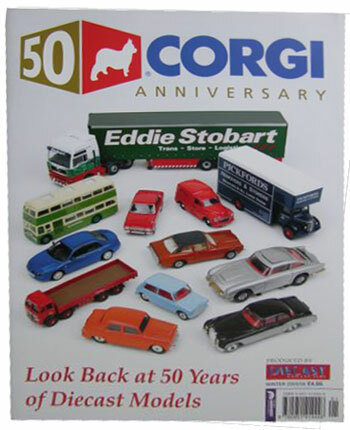 I produced this quality Guide in association with Corgi whilst Publisher of Diecast Collector & Collectors Gazette magazines to celebrate the 50th Anniversary of the company. 92 pages, A4 and full colour with hundreds of pictures the publication is packed with fascinating information charting the history of the company from it’s early Mettoy beginnings upto the company being taken over by Hornby. Featuring models and staff interviews from the early years, this celebratory publication includes, casting variations, how the company got a stronghold on the British and world toy markets in the 1960’s and the huge risk it took in producing it’s early TV range and offers a fascinating insight into the commercial , bus, aircraft, circus, emergency and larger scale models produced during it’s glory year. The publication finishes off with the history and models of the later Corgi Classics & Vanguard (post Lledo) ranges.